The terrorist attacks in Paris last Friday tragically reminded us that when students go abroad, they are not provided with a protective bubble. Among the fatally wounded was Nohemi Gonzalez, a 23-year-old American design student from California State-Long Beach. She was killed in the drive-by gunfire at the La Belle Equipe bistro. News reports tell us that she was an outstanding student, and that the opportunity to study in Paris was a dream come true. Here in America, we think of study abroad as a wondrous opportunity to explore and learn in a different country. These sentiments are usually spot on. But someone can be in the wrong place at the wrong time, and another may be in harm’s way due to youthful daring or indiscretion. Nohemi Gonzalez was in the wrong place at the wrong time. She was killed while enjoying a Friday evening with friends over food and drink. She did nothing to provoke what happened to her. Police said that a Palestinian man drove by a line of cars sitting in traffic and fired multiple bullets before “intentionally” crashing into a group of people.
. . . Schwartz was on his way back from handing out food to soldiers when he was shot, according to a statement from Camp Yavneh, where Schwartz was a former camper and counselor. Then there’s the story of Amanda Knox, who was spending an academic year in Italy when she was implicated in the murder of a flatmate, Meredith Kercher. Knox was convicted at trial and spent several years in prison. She ultimately secured an acquittal from the Italian Supreme Court in a case that was riddled with biased proceedings against her and a lack of reliable evidence connecting her to the killing. As for the possibility of a study abroad student taking dumb chances, I can supply a personal story. I had become interested in the conflict over Northern Ireland, so I figured, what better way to learn more about it than to visit Belfast? After all, I had been an editor of my college newspaper, and so why not be a sort of junior foreign correspondent? Amid bullets flying about or an explosion going off, I would be an observer, not a casualty, right? I took the photo above as I was walking back to the Belfast youth hostel. 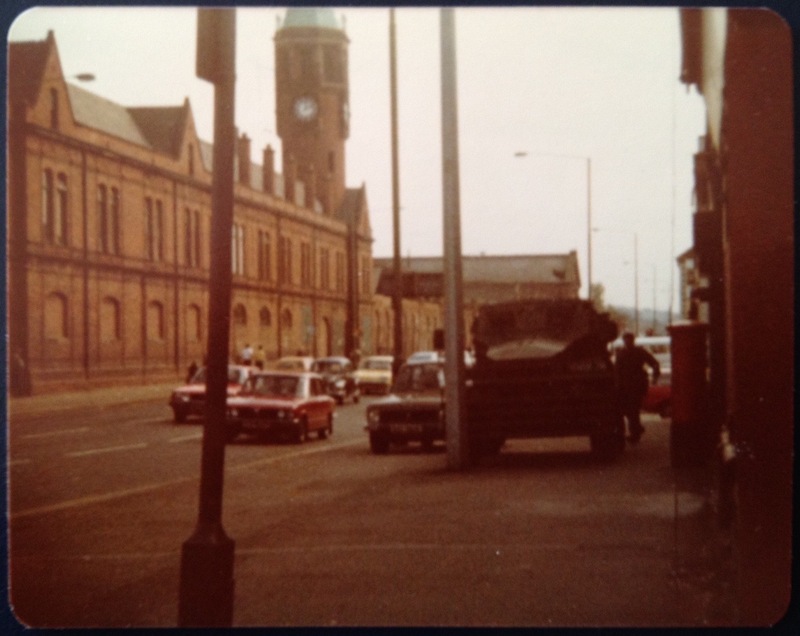 Ahead of me was the British army vehicle in the picture. I saw a rush of activity, with soldiers moving quickly, rifles in hand. By the time I reached the vehicle, they were leaning against it, with their weapons pointed across the street. When I asked one of them what was going on, he said tersely, “just keep walking.” I did, briskly. I never learned if anything more significant happened after my hasty exit. I also would accept an offer from a BBC reporter to take me on a short drive through dicier parts of Belfast where he had conducted some recent interviews with IRA leaders. It was a fascinating impromptu tour, and I would’ve never trekked into those areas of town on my own. But thank goodness he was legit, for this brilliant “foreign correspondent” never thought to ask him for identification. It all makes for a good story after the fact, but in reality I had taken foolish risks for the sake of feeling adventurous. Such is youthful ignorance. What does this mean for a young student pondering whether to see a bit of the world? In light of recent events, I wouldn’t blame students or their parents for reconsidering a decision to study abroad. But someone who passes on such an experience for safety reasons could easily find herself waiting, say, near the finish line of the Boston Marathon. I’m afraid that contemporary life today has this random quality to it. Appropriate caution and prudence, not absolute isolation and avoidance, should be the governing principles when it comes to study abroad or any other decision that involves stepping outside of our homes. Beyond that, our control over larger events is somewhat limited.